Discomfort often tips people toward new behaviors. #1. Have them quickly. Delay makes matters worse. Delay under the guise of not hurting someone’s feelings hurts you and your relationships. Stress goes up when you don’t say-what-you-see. Long-term stress seldom makes things better. #2. Discuss impact versus intent. Most team members want to do well for themselves and others. They don’t, for example, intend to demotivate others. Believe positive intent. Explain negative impact. #3. Explain how they aren’t serving themselves well. Self-interest is a great motivator. #4. Make room for personal concerns. One manager, after discussing poor performance with an employee, asked a third party in the room if he could give him a minute with the employee. When they were alone, he explained to the employee that he was surprised about the poor performance. “This should have been easy for you.” He asked if something was going on. He took time to listen to personal concerns without inviting excuses. The result was relief and renewed energy. What are the key factors that make tough conversations successful? I love the idea of recognizing that the impact doesn’t always match the intent. I think this approach would lead to an open, honest conversation that doesn’t cause the person to play defense. Thanks for the insight! Tough conversations go better when you have something to bring to the table. When you can offer nothing in the way of reward, encouragement or punishment expect hot air, very little changes. 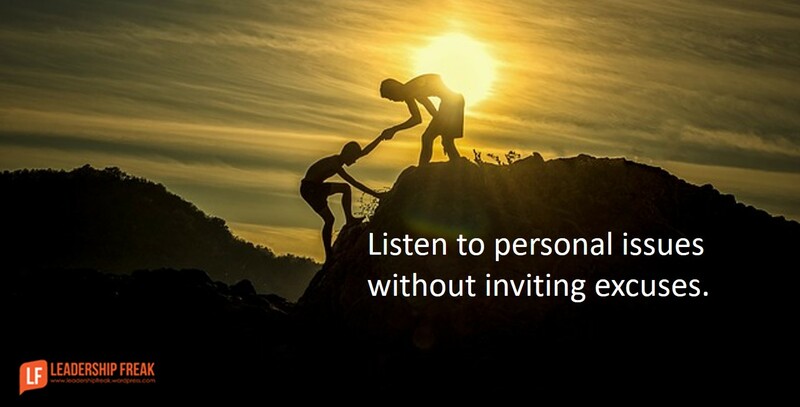 For me effectively handling tough conversations is about seeing the other person’s potential, not their limitations, about really listening and letting the conversation change you, have an impact on you. But then, the first question is, what do you want to get out of it?